Kaelan Boyce is an effervescent and friendly character who is often misunderstood. 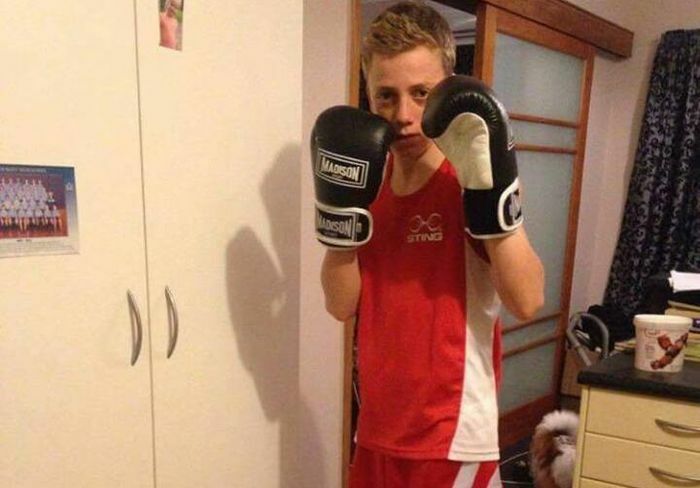 He suffers from ADHD and complains that bullying is the reason he got into boxing. “My dad’s friend got me into boxing. I was being bullied and Dad and I agreed we had to do something about it so I started fighting,” Boyce says. Kaelan has been a national champion in his weight class for the last three years. In 2012 he won the 40kg cadet class. In 2013 he was the 48kg cadet champion and last year he captured honours in the 50kg junior category. Boyce made an inauspicious start as a pugilist. “My first fight was on May 21, 2011 against Dalvin Cook in Gore. It was his sixth fight and my first. I was so nervous. It was so scary. I lost 11-8 and never wanted to fight again,” Boyce laments. Boyce trains out of the Redwood Boxing club in Christchurch. He is coached by former New Zealand representative and senior amateur champion Julian Scully. “Julian is the man. He has a huge knowledge of the sport and has done everything to help me,” Boyce acclaims. After his original setback Boyce won 13 fights in a row. One rival brought out the best in Boyce. “I was a replacement on one card, going up two weight classes. I won a split decision against this guy and his coach demanded a rematch. The next time I dropped him and his coach threw in the white towel,” Boyce recalls. Going up in weight class is not an uncommon step for Boyce. He typically fights at around 52kg, but has been forced to face fighters 59kg and above in the purist of stiffer competition. Boyce wasn’t restrained in this year’s South Island and North Island Golden Gloves. He won both titles and earned selection for the New Zealand Junior team to travel to Saint Petersburg in Russia for the Junior World Championships in September. Fundraising for the event was an arduous task. “I had to raise $7000 just to get there. I set up a Givealittle page, had a sausage sizzle at school – the Mad Butcher gave me 300 sausages. I held four raffles. I was really grateful for people’s generosity, it was huge,” he says. The Junior World Championships is a huge event with 57 countries and 442 countries represented. The conditions weren’t always easy. “The Russians weren’t happy at all. Their coaching staff nearly had a fight with the kitchen stuff when they complained about the quality of the food. I felt sorry for the Russians,” Boyce laughs. Boyce’s first fight was no laughing matter. He drew a formidable Indian opponent. “I lost the first two rounds, but it was close. In the third round I came out all guns blazing, but unfortunately I could not pull it back. I was gassed,” Boyce concedes. Naturally disappointed, Boyce used the remainder of the trip to gain valuable experience. He sparred against fighters from Japan, England, Australia, Tonga and the Philippines, the Philippines opponent trained in the same gym as Manny Pacquiao. However the toughest assignment was containing the European champion from Albania. “That guy hit like a rocket. One of my teammates got dropped and vomited afterwards”, Boyce says. Boxing still doesn’t sit comfortably with Boyce’s Mum, but he has won 31 out of 41 fights and plans to carry on. As for the bullies they are no hassle anymore. Boxing is in the blood. Ryan Scaife fought competitively for the first time when he was nine years old. He laughs he was 34kg, but still managed to beat New Plymouth's, Logan Toa. "It was three ninety second rounds and we just tried our best to avoid each other. I could hardly throw a punch, but I was happy to get the win on points", he says. It seemed pre-ordained Ryan would enter the sport of boxing. The Scaife family is a famous name in the game. Grandfather Alan, father Grant and brother Harry were all senior National champions in the Light Welterweight and Welterweight disciplines. In 1979 the family helped bring Muhammad Ali to Upper Hutt. "Boxing is in the blood. Dad didn't put any pressure on me to do it, but I wanted to. It seems pretty crazy that Ali was hanging out in Heretaunga at one time. I wish I had been born to meet him. The whole thing is pretty inspiring," Scaife says. Scaife's form since his debut has been inspiring. He has won 45 out of 49 fights and captured five national age group titles. He has never suffered a knockout and hasn't lost in New Zealand since the age of 12. 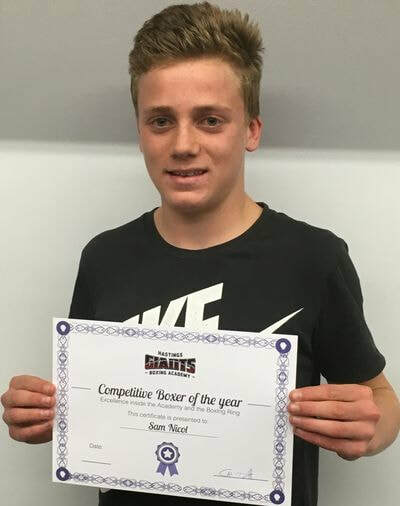 He won the national youth title in the 69kg division in 2014 and was also named the most scientific youth boxer at the New Zealand championships. Earlier in 2013, Scaife won the open junior 66kg division title at the North Island Golden Gloves. That secured him a ticket to fight in the World Junior championships in the Ukraine. "Ukraine was like a concrete jungle. It was on the brink of civil war. There were armed police on the streets, a lot of tension among the people and I didn't perform my best. It was very intimidating to be honest." Scaife wasn't intimidated by former heavyweight champion of the world and then leader of the opposition Vitali Klitschko. Scaife got a chance meeting with Vitali. "He showed up at the championships and was mobbed. The respect for him over there is huge. He came to meet all the fighters and I got his autograph. For someone so big, he seemed real accessible," Scaife says. This September (5-11) the Youth Commonwealth Games are going to be held in Samoa. Scaife has been selected to represent the New Zealand team. Recently in Queenstown he beat Jack Seabourne, an Australian national title holder, at the "Clash of the Tasman" tournament. He was awarded the "fighter of the night," despite battling a harsh flu. Scaife previews his prospects in Samoa. "It will be very tough. The Aussies are always very strong so it was good to get that result in Queenstown. I expect there will be a few real good quality fighters from England, especially, and South Africa too." It will cost Ryan $5000 to attend the Youth Games. The boxer is looking for sponsorship to help cover the costs. If you can help please call Grant Scaife, Ryan's father, on 0275451586. Scaife passed Level 2 NCEA with an excellence endorsement and is on target to achieve the same result in Level 3 studies. Scaife trains at least 15 hours a week and sometimes three times a day. Scaife was the McEvedy Shield athletics captain at St. Patrick's College, Silverstream. He has won the 800m, 1500m and 3000m titles at the iconic event. Scaife says his favourite boxer is Sugar Ray Robinson. He especially loves the story about Robison's relationship with Jimmy Doyle. Doyle was fighting in Cleveland, after suffering some heavy knockouts in California. The state's boxing commission would not sanction him to fight again. However he challenged Sugar Ray in 1947 and Sugar Ray knocked him out in the ninth round. Doyle later died of head injuries. Doyle was pushing himself to fight to "buy his mother a house" and after Doyle's death, Robinson gave the earnings of his next four fights to Doyle's mother, so she could buy that house.